If you don’t know whether the cladding on your building is combustible, you are soon going to be forced to find out. The issue over what cladding has been used on buildings crystallised after the Grenfell Tower fire in the UK in 2017. 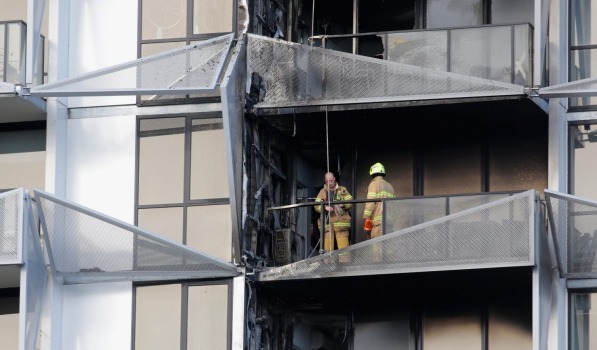 Australia’s equivalent (without the horrific loss of life in Grenfell) was the Lacrosse Tower fire in Melbourne in 2014 (Image Below). The ABC’s Four Corners covered the issue in this excellent episode. The Queensland approach has been to create the Non-Conforming Building Products audit taskforce which led to the government addressing concerns with all of their buildings. Then the building is caught by the new regulation. The obligations will commence on 1 October 2018. If your building is one of those in the compliance zone, you need to complete an online form via the QBCC that will run you through whether the building is likely to be one of those with non-conforming cladding. Every building will have until 29 March 2019 to complete this. And no – we don’t know what the checklist will include yet. If your building is one that may have non-conforming cladding you have until 29 May 2019 to go back to the QBCC with a statement from a building industry expert about whether the cladding on your building is non-conforming. If you know your cladding is non-conforming, you can skip this step and go to stage three. There are only two months between the last date to register and the date on which this first assessment is required. We suspect it will not pay to be tardy in getting started, as there are fines for missing the deadlines. If you have non-conforming cladding, then you must have a qualified fire engineer complete a fire risk assessment about the safety of the building. That assessment will determine whether the scheme as it is will essentially remain safe or whether rectification works are necessary. There are only two months from the last date for registration to the time to return the building industry expert report. If bodies corporate leave it to the last minute we suspect there won’t be enough experts to go around. Get started and get started early, because when you allow for the Australian holiday season (Melbourne Cup Day through to Australia Day), there is also another three months that disappears very quickly during that registration period. Tenants will be a lot harder. For those with onsite management or professional property managers, it may be okay as they should have systems that will deal with it. Communicating what needs to be actioned with property managers will be important. For people who self-manage or use a property manager who does not know what they are doing, the reality is tenants may not be told. Our immediate interpretation is that holiday / corporate tenants probably do not need to be told, but time will tell. We suspect the fact that non-conforming cladding may be present is going to be a potential disincentive to prospective property buyers while it is not known, and a genuine turn off to them once it is certain. It wouldn’t surprise us if there was some change to the disclosure regime to specifically address this issue. After all, the disclosure form at the moment includes who the body corporate secretary is. Whether the building has non-conforming cladding is probably a tad more important. The Lacrosse Tower owners are still fighting about who wears what cost five years after their fire. The statutory position is that if rectification is required, then the body corporate must do it. It may well have a right to recover those costs from parties involved in the construction process, but that right is independent of the immediate obligation to sort the issue out. This means owners are going to have to pay special levies, or bodies corporate borrow money, to bring their building back to having conforming cladding. Bodies corporate will not be allowed to wait to do that until they try to recover the costs from a third party. 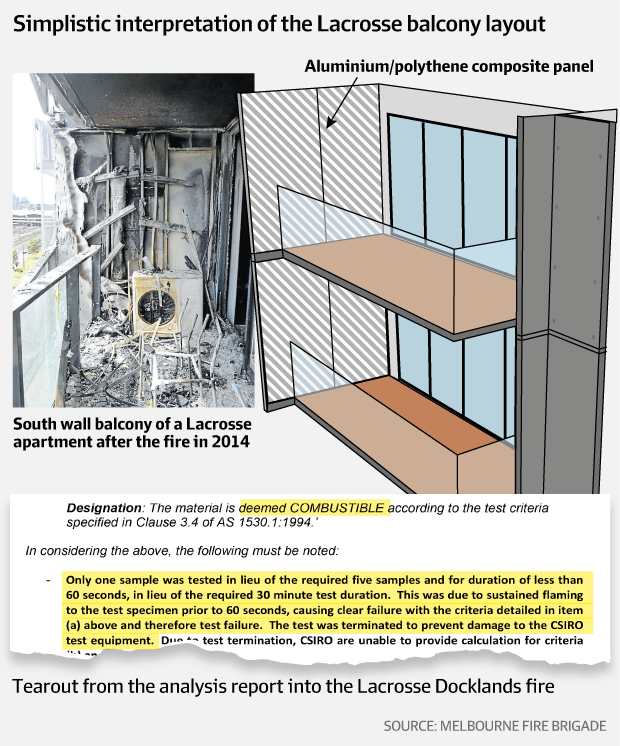 Just because cladding is non-conforming may not mean it needs to be removed. The other fire safety mechanisms may cover any risk appropriately. Having said that, the non-conforming cladding could still very well be considered a defect in common property (although we are still debating that internally). There are arguments for an against this, but if it is not a defect, why is there the need for the conspicuous sign in the building about it? We like providing solutions, but with this one there is a long way to go before the air clears.